Doctor Spook from Minds Eye Media did some DJ/VJ sets and visuals for the Bonnaroo music festival featuring The Police reunion and The White Stripes in June of 2007, and returned again in 2008 to do even more sets. Clips from these shows and many more will be included on the 10 new Minds Eye VJ DVDs coming soon. 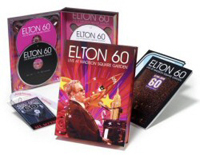 A new Blu-ray HD DVD version of this show is now out. Playing on huge 180 foot wide screens behind the performance on March 25th at Madison Square Garden were some fresh 3D HD visuals done by Minds Eye Media. We did the VJ visuals for 13 of the 18 songs including the big 6oth 3D birthday background. NBC broadcast this event on April 12, 2007 and you can watch it here. Learn how to write a great script or story fast! Follow along with 20+ hours of DVD story coaching taking you through a fast & unique step-by-step process for creating a brilliant script or novel. Fill in your answers to the questions in your DVD Workbook (300+ pages) to end up with a solid blueprint for any script, story or novel fast. This DVD workshop teaches you EVERYTHING you need to know to write like a professional Pixar level story artist. MyFlik is an online microbudget movie studio and free film school that develops, funds, produces, markets and distributes short and feature digital films, TV shows and animations. This new online digital filmmaking studio is now going up in phases. The idea behind MyFlik is to provide a community and support structure where filmmakers can make a living doing what they love! A mind blowing new concept in immersive psychedelic journeys presented as a double disc DVD/CD featuring 11 new trance music videos. Not only are you taken on a 60 minute Maya 3D Animated excursion through Dr. Spook’s vivid imagination, you will be treated to the best of the worlds most innovative psymasters!! Watch it here online. This innovative new book takes the reader through a unique step-by-step preproduction process, using lists of brainstorming ideas and 1000's of possible visual storytelling techniques. 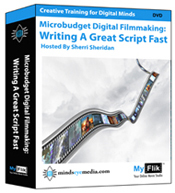 A must have resource for the next generation of digital micro-budget filmmakers. Developing Digital Short Films is now being used as a textbook at film and animation schools all over the world! Discover a new dimension of beauty and wonder as you explore over two and a half hours of amazing 3D animation with visuals that are synchronized to the incredible soundtrack. Featuring musicians such as Growling Mad Scientists, Medicine Drum, ABA-Structure, Deviant Species, Miraculix, Chromatone and Shpongle. A 45 minute VJ mix loop is included on this "Magnus" DVD to play at your own events. Watch the self described "Seabiscuit" and "Johnny Appleseed" of the 2000 and 2004 Presidential elections talks about creating a sustainable way of life in America. This five minute film showcasing Dennis's platform was shown at each campaign stop to warm up the crowd and on TV. Explore a magical 3D Maya desert landscape full of blowing flags and ethereal music in Nathan Vogel's latest music video "Deep Step". The band is ABA-Structure, featuring a bluescreened Irena Mikailova on vocals. This amazing music video is part of the new "Magnus" DVD. Get hypnotized by all the spinning 3D Buddhas and trance like motion graphics in this futuristic music video created for the band Paradise. A digital work of art featuring the European top 10 dance club hit song "Rising Sun" now playing on MTV Europe. Become entranced watching a dancing 3D Maya eyeball creature, with lots of tentacles that are animated using the soundtrack data for perfect synch. 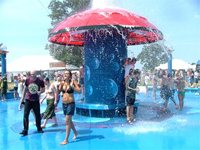 The music for this track was created by The Growling Mad Scientists and X-Wave. This mesmerizing music video is one of about ten new ones on the "Magnus" DVD. Check out this feature length DV documentary on the worldwide trance music scene created by Torsten Klimmer. This visually stunning film is quickly becoming a cult favorite all over the globe. See Dr. Spook's interview (a.k.a. Nathan Vogel - Technical Director at Minds Eye Media), where he talks about the importance of "following your bliss". Nate's interview comes right after the one from visionary artist Alex Grey. You can view this film online in its entirety or purchase the DVD at www.liquidcrystalvision.com.